Written for practitioners of data mining, data cleaning and database management. Presents a technical treatment of data quality including process, metrics, tools and algorithms. Focuses on developing an evolving modeling strategy through an iterative data exploration loop and incorporation of domain knowledge. Addresses methods of detecting, quantifying and correcting data quality issues that can have a significant impact on findings and decisions, using commercially available tools as well as new algorithmic approaches. Uses case studies to illustrate applications in real life scenarios. Highlights new approaches and methodologies, such as the DataSphere space partitioning and summary based analysis techniques. Exploratory Data Mining and Data Cleaning will serve as an important reference for serious data analysts who need to analyze large amounts of unfamiliar data, managers of operations databases, and students in undergraduate or graduate level courses dealing with large scale data analys is and data mining. TAMRAPARNI DASU, PhD, and THEODORE JOHNSON, PhD, are both members of the technical staff at AT&T Labs-Research in Florham Park, New Jersey. 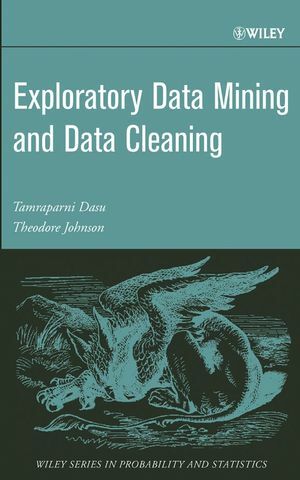 1 Exploratory Data Mining and Data Cleaning: An Overview. 1.6.1 EDM Summaries - Parametric. 1.6.2 EDM Summaries - Nonparametric. 1.7 End­to­End Data Quality (DQ). 1.7.1 DQ in Data Preparation. 1.7.2 EDM and Data Glitches. 1.7.4 End­to­End DQ: The Data Quality Continuum. 2.3 EDM: Exploratory Data Mining. 2.5 What Makes a Summary Useful? 2.6 Data­Driven Approach - Nonparametric Analysis. 2.6.1 The Joy of Counting. 2.6.2 Empirical Cumulative Distribution Function (ECDF). 2.7 EDM in Higher Dimensions. 2.9 Depth and Multivariate Binning. 3 Partitions and Piecewise Models. 3.1.1 Why Do We Need Partitions? 3.1.3 Applications of Partition­based EDM Summaries. 3.2 Axis­Aligned Partitions and Data Cubes. 3.5 Set Comparison Using EDM Summaries. 3.5.3 Statistical Tests for Change. 3.5.4 Application - Two Case Studies. 3.6 Discovering Complex Structure in Data with EDM Summaries. 3.6.1 Exploratory Model Fitting in Interactive Response Time. 3.8.1 Quantile­Based Prediction with Piecewise Models. 4.2 The Meaning of Data Quality. 4.2.3 Gaps in Time Series Records. 4.3 Updating DQ Metrics: Data Quality Continuum. 4.4 The Meaning of Data Quality Revisited. 4.4.6 Data Quality - A Many Splendored Thing. 4.5.1 DQ Components and Their Measurement. 5 Data Quality: Techniques and Algorithms. 5.2 DQ Tools Based on Statistical Techniques. 5.2.4 Time Series Outliers: A Case Study. 5.3 Database Techniques for DQ. 5.3.1 What is a Relational Database? 5.3.2 Why Are Data Dirty? 5.3.3 Extraction, Transformation, and Loading (ETL). 5.4 Metadata and Domain Expertise. 5.5.1 Inventory Building - A Case Study. 5.6 Data Quality and Its Challenges.